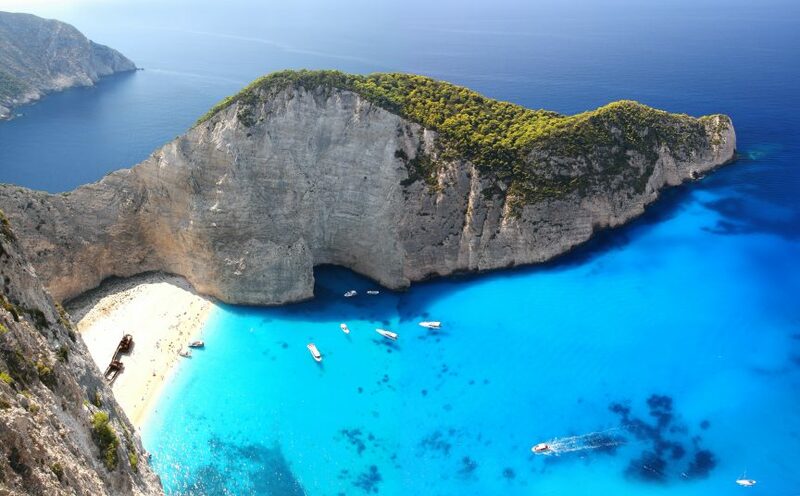 The pristine blue mediterranean sea surrounding Greece is home to over 6,000 beautiful islands. While only 227 of them are inhabited, each island has a unique culture and landscape, ensuring that each destination will bring a brand new adventure. Between the beautiful scenery, the friendly people, the amazing history, and the delicious cuisine, this paradise is one of the most popular tourist destinations on earth. 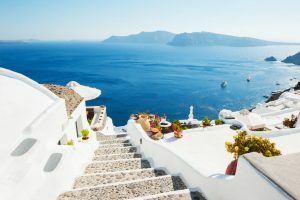 With so many incredible destination choices in Greece, how do you choose which islands to visit? Join us on Paul W. & Kim’s Dream Vacation to explore some of the most beautiful Greek islands! 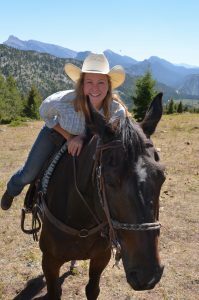 Major bonus alert–on top of unforgettable adventures in Greece, this trip also includes time in Barcelona, Sicily, Malta and Palma de Mallorca. Athens was once home to one of the world’s most powerful empires. It now serves as an incredible destination for archaeology and history. Visit the towering columns of the Parthenon on a WJR Travel Club exclusive tour. Stand atop the Acropolis, a UNESCO World Heritage Site, and look down at the beautiful city of Athens below. 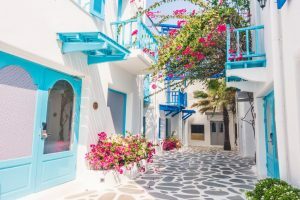 Mykonos is one of many picture–perfect destinations in Greece. Its twisting streets are lined with iconic whitewashed houses and beautiful shops. Mykonos will bring adventure to any vacation as you walk the same winding streets that pirates once pillaged. Mykonos is also home to iconic windmills and pristine beaches. 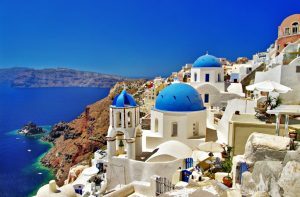 When you picture Greece, do you imagine whitewashed houses and blue domed church roofs? If so, you’re probably picturing the beautiful island of Santorini! This whitewashed village is believed to be the birthplace of the gods…and it’s easy to see why! Visit the capital of Fira and explore its meandering cobblestone streets. High up on the cliffs, Fira can only be reached by cable car, donkey, or a flight of 600 steps! Rhodes is the largest of the Dodecanese Islands and is considered one of the sunniest places on earth…over 300 days per year! Visit amazing historic sites as you walk down curving medieval streets. Rhodes is home to a variety of unique landscapes from pristine beaches and wooded areas to magnificent ancient ruins. Barcelona has become a city known for its unique blend of modern and medieval culture. This famous tourist destination is filled with European charm and architectural gems dating back some 2,000 years. 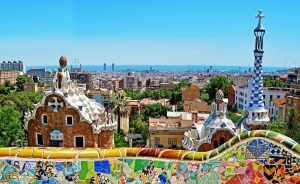 Enjoy a half day tour of this beautiful city including a visit inside the iconic Sagrada Familia, a majestic Roman Catholic church designed by Catalan architect Antoni Gaudi. Palma de Mallorca is an island often described as a mini Barcelona. Filled with incredible gothic architecture, this city is filled with amazing culture. Visit Es Baluard, the museum of modern and contemporary art, or visit the wide variety of shops as you look for a bargain. Located in northeastern Sicily on the slopes of the Peloritani, Messina has a unique and fascinating history. You’ll visit the ruins of Santa Maria Alemanna church built in 1220 AD along with the Duomo di Messina, an impressive cathedral that includes an incredible display of historical artifacts. Valletta is home to many historical fortifications built by the Knights of Malta. The walled city was founded in 1566 and it remains a preserved medieval treasure. Visit Saint John’s Co-Cathedral, wander down old cobblestone avenues, and check out the amazing works of art. You will quickly see why this beautiful town has earned UNESCO World Heritage Site status. If you’ve always wanted to experience the beauty of this dream destination, join us on Paul W. & Kim’s Dream Vacation aboard the Celebrity Reflection September 29-October 13. Call 800-383-3131 today to reserve your spot on this once-in-a-lifetime voyage! Ready to take a trip of a lifetime?Let's Go!